Detroit Michigan Wedding Planner Blog: Set Me Up! While upcoming prospects in the hospitality industry are undoubtedly in need of a good education nowadays, there is much more than just street smarts that meet the eye. Have that hands on work experience is just as, if not as important. Many more personal and direct situations will be encountered and addressed. 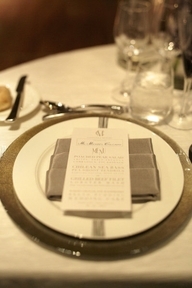 Special occasions require a more formal table than the traditional five-piece place setting. 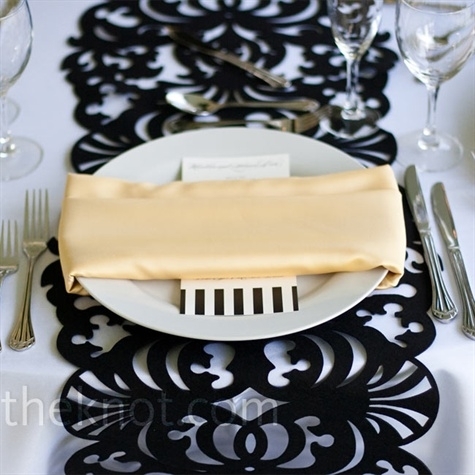 Luckily, the modern art of table setting is quite simple once you understand a few basics. Settings vary slightly by country and personal preference, and there's no absolute right or wrong. If you learn the essentials of a well-set table, we guarantee you'll feel like a more confident, comfortable host no matter the occasion. "Once you realize table setting is based on logic, things become less intimidating," says etiquette consultant Pamela Hillings, author of "Manners in a Minute: Dining." For example, you begin eating a meal by using the flatware at the outside left and right, and then work toward the plate as the meal proceeds. Stemware is set above and to the right of the dinner plate; bread-and-butter plates sit above the plate and to the left. Flatware should align with the bottom rim of the charger, a large plate, which will be removed after everyone spreads his napkin on his lap (napkin rings, customary at family meals, may be used as a festive decoration). The water glass stands above the dinner knife, white wine to its right, and red wine top center. Soup is served in a heated soup dish atop a dinner plate, and eaten with the soupspoon, at outer right. When every guest has finished and laid his spoon, bowl up, across the upper righthand corner of the plate, the plate, bowl, and spoon will be removed. The bread-and-butter plate and butter knife remain. A midsize plate arrives bearing the fish course. Use the short, broad fork at outer left and the fish knife at outer right. When they have finished this, or any other, course, guests should place their silverware diagonally across the plate -- handles at 4:20 and knife blade facing in. Salad is served on a midsize plate and eaten with the remaining fork, which has a broader end tine than other forks and can be used for cutting. After this course, the bread-and-butter plate, butter knife, and both wineglasses will be cleared, along with the salad plate and fork, leaving the table set for dessert. For more information on table settings or assistance in planning your perfect day, contact You're The Bride at 248-408-4602 or via email.